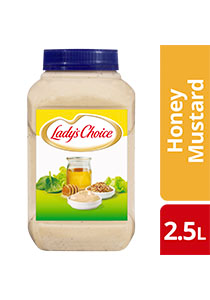 Made with real quality ingredients, Lady's Choice Honey Mustard Dressing helps you to deliver consistent salad dishes. All additives are of plant and synthetic Origin. May contains traces of cereals containing gluten, soy, fish, peanut and milk. The perfect blend of sweet and tangy flavours. Made with real mustard and real honey, this is just as delicious on sandwiches and for dips as it is on salads.